Looking for cheap extension design ideas? If you want to add living or bedroom space to your home, but are on a tight budget, there are plenty of affordable ways to do so. Keeping the design and construction type simple, choosing the materials off-the-shelf rather than specifying bespoke pieces and project managing yourself are all simple ways to keep extension costs down, but some extension types are also naturally cheaper than others. Check out these cheap extension ideas to add more space to your home without breaking the bank. Want practical advice? Read our ultimate guide to extending a house. Need to work out whether you can afford the extension you're planning? Check out our extension cost calculator for an estimate. As garden space, side returns often aren’t well used and don't add value to your home, but building a single storey extension into one can transform your existing, perhaps narrow, back room into one that's spacious and light-filled. You probably won’t need planning permission for a side return extension. The current permitted development regime allows single storey side extensions up to a maximum of 4m high and a width no more than half that of the original house. If the extension is within 2m of the boundary, eaves height should not exceed 3m. Building work costs depend on the results you're after, but reckon to pay around £1,500 to £1,900 per square metre for basic quality; for a side return extension of 2m x 5m, the build cost could be as low as £20,000 upwards. Find out more about building side return extensions in our practical guide. 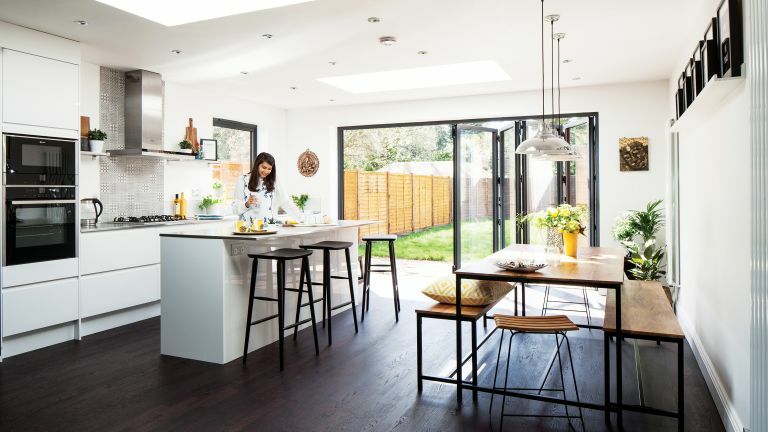 Use our guide to planning a kitchen extension for tips, too. Think carefully about design; the porch should be constructed in a style that suits the original architecture and in proportion with the size of the house. When designing an enclosed porch, consider the impact it might have on the natural light that flows through your existing front door – you may be able to improve the amount of daylight with a well-considered design. A brick-built porch with a new front door can cost anything from £3,000, depending on size and materials. Find out more about adding a porch in our practical guide. A garage conversion can add up to 10 per cent to the value of your home, give you extra living space that's less prone to planning complications than an extension, plus you won't lose any garden space. If have a double garage, you could even convert just half the space, so that you gain living space and continue to benefit from a parking space. Converting a garage is also much cheaper than building a new extension – expect to pay anything from £5,000 upwards. Find out garage conversion planning and design in our comprehensive guide. Looking for cheap extension ideas that use your budget cleverly? Cladding or rendering the exterior of an extension built with a timber frame or block work will work out much more affordable than facing it with brick. Ideal for giving an extension a contemporary finish, it can suit both modern homes and period properties. Bear in mind that some cladding materials will need more upkeep and maintenance than others – read our guide to exterior claddings and renders to pick the right finish for your extension. Assuming the garage's existing foundations can take the load, building a room on top is much more cost-effective than building a new extension – plus you won't be sacrificing garden space to gain a new room. Check with an engineer or surveyor about structural challenges, and hire a designer and a good builder to ensure that the new room feels like a natural part of the original house inside, and looks like it's original from outside, too. Expect to pay from around £15,000 to £25,000 for this type of extension; building regulations and planning permission both apply. If you're looking to keep design and build costs down, stick to a simple square or rectangular extension, specify fixed rooflights rather than large expanses of frameless glazing or windows that slide open, and plan a patio door opening that will accommodate off-the-shelf doors rather than bespoke designs. Interior fit out costs can be kept down too. Obviously, you can choose to shop for affordable flooring, lighting and fixtures, such as kitchen units, but planning your project carefully and in great detail before work starts – right down to the position of electrical sockets and lighting controls – and avoiding making changes as you progress will keep costs under control. Find out how to project manage an extension or house renovation in our guide. Adding a simple conservatory, whether a period-style extension or a more modern build, is a cheap extension idea that gives you year-round living space and that much sought-after indoor-outdoor appeal. Hiring a design and build company will keep costs predictable, but doing some of the work yourself will save money. DIY, ready-to-install conservatories can cost as little as £3,000, but these won't add value to your home; it's better to choose a mid-priced design, which can cost from £15,000 to get a room that will be comfortable even on hot and cold days. Timber frame extensions can make for cheap extension design ideas; materials can work out a little more expensive than building with block work, but the speed of the build can make up for that in lower labour costs. Better still, timber-frame extensions can be finished to look no different to one constructed from block work, so aesthetics don’t have to be a consideration. Expect to pay from around £1,800 per square metre. Find out more building a timber frame extension in our guide. Converting a loft gives you extra living space very cheaply when compared to building a ground floor extension. It's also said to add the most value to a home compared to how much it costs. Better still, you'll gain more room without losing garden space, and your loft conversion should be allowed under permitted development rights, meaning there’s no need to go through the lengthy process of obtaining planning permission. Loft conversion costs will vary depending on size, but is usually between £30,000 and £50,000. You can keep costs down further by choosing rooflights over dormer windows. Find out more about converting your loft in our guide. Building a garden room is a cheap extension design idea for anyone who needs more space but has no room for an extension near the house. At the cheaper end of the market, go for a modular kit, which will also allow you to predict the extension costs from the beginning. Expect to pay anywhere between £2,000 and £30,000. The project, by Plus Rooms, cost £49,070 for design and build. Find out more about permitted development rights for extensions in our guide. Julia Little added a dormer loft bedroom, created a bathroom and reconfigured the ground floor of her home under permitted development. 'I knew I would need to borrow to buy another house, so why not spend the difference on making the house better instead? There were no planning permission required, so things progressed fairly swiftly. The project cost £43,000 including kitchen and bathroom, by Intervention Architecture.